Thunderbird Field II Veterans Memorial, Inc. has announced that the centerpiece of the Thunderbird Field II Veterans Memorial at the Scottsdale Airport, a World War II era Boeing-Stearman PT-17, was officially retired Saturday, May 12, 2018. The ceremony, a traditional water salute, was outside Ross Aviation at 14600 N. Airport Drive. Thunderbird Field II is a 501(C)(3) non-profit organization with the goal of preserving the history of aviation in Scottsdale and all military veterans, and providing scholarships for Arizona students interested in aviation. The water salute is an airport tradition to honor military veterans, foreign dignitaries and aircraft entering or retiring from service. Salutes typically involve two firefighting rigs spraying arcs of water over an arriving or departing flight. Each water cannon salute, which lasts one-two minutes, can use as much as 3,000 gallons of water, so it involves the airport’s fire department resources, according to a press release. 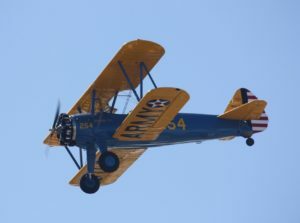 Steve Ziomek, a former U.S. Coast Guard rescue pilot and Chairman of the Thunderbird Field II Veterans Memorial, piloted the Stearman. On board was memorabilia commemorating the life of the late Capt. Jerry Yellin, the last fighter pilot. Mr. Yellin flew his first flight at 19 years old in a Stearman in 1942 at Thunderbird Field II in Scottsdale. Mr. Yellin’s last flight was on Nov. 9, 2017, at the Scottsdale Airport in this Stearman bi-plane. This article was initially published by Scottsdale Independent. Copyright 2018 Scottsdale Independent. All rights reserved.